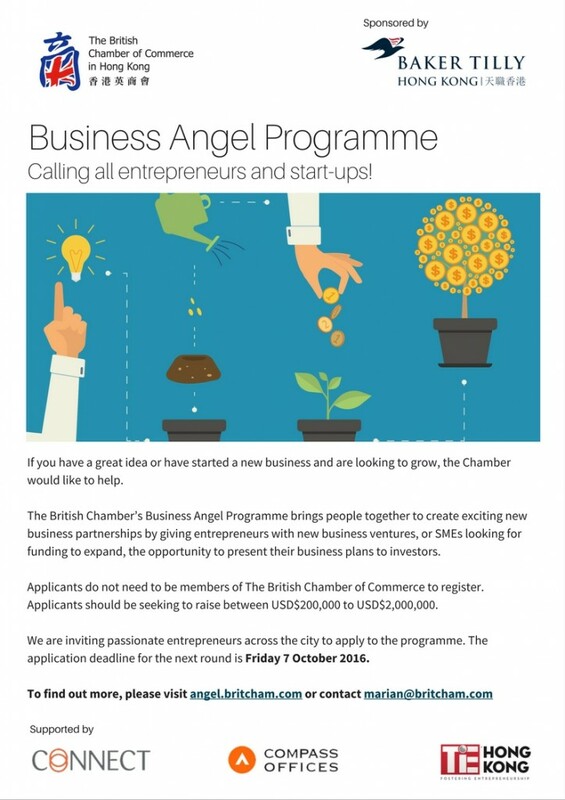 The British Chamber Business Angel Programme: Calling all entrepreneurs and start-ups! If you have a great idea or have started a new business and are looking to grow, the Chamber would like to help. The British Chamber’s Business Angel Programme brings people together to create exciting new business partnerships by giving entrepreneurs with new business ventures, or SMEs looking for funding to expand, the opportunity to present their business plans to investors. Applicants do not need to be members of The British Chamber of Commerce to register. Applicants should be seeking to raise between USD$200,000 to USD$2,000,000. We are inviting passionate entrepreneurs across the city to apply to the programme. The application deadline for the next round is Friday 7 October 2016.